If you're looking for adventure, the Western Caribbean should be your choice. Visit ancient ruins near Cozumel and Costa Maya in Mexico, snorkel around the reefs in Grand Cayman, or simply soak up the sun while cruising the balmy Caribbean Sea. With additions inspired by Oasis-class ships, Freedom of the Seas® is destined to ignite your imagination. See Shrek parade across the deck as part of the just-added DreamWorks Experience.Then end your evening with a selection of reds or whites at the now-more-intimate Vintages wine bar. Plus, enjoy the innovative and complimentary features Freedom of the Seas has always been known for—FlowRider® surf simulator, rock climbing wall, ice-skating rink, Freedom Fairways mini golf course, H2O ZoneSM water park and more. 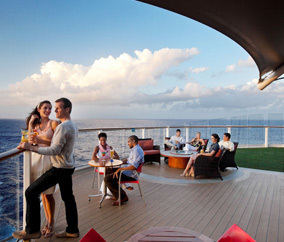 Active travelers of all ages will find much to enjoy aboard a Royal Caribbean cruise. All ships feature rock-climbing walls, many have mini golf and ice skating, and Freedom of the Seas even has a surf park and boxing ring. Dining choices are varied, and entertainment is Vegas-glitzy (don’t miss the ice show aboard Freedom of the Seas). Destinations include the Caribbean and beyond—the Mediterranean, Mexican Riviera, Australia and New Zealand, South America, and more.